Civilization VI is now available not just for the iPad but for the iPhone as well. AppleInsider has spent several hours (for science) testing it out to see how it compares to its iPad and Mac counterparts. 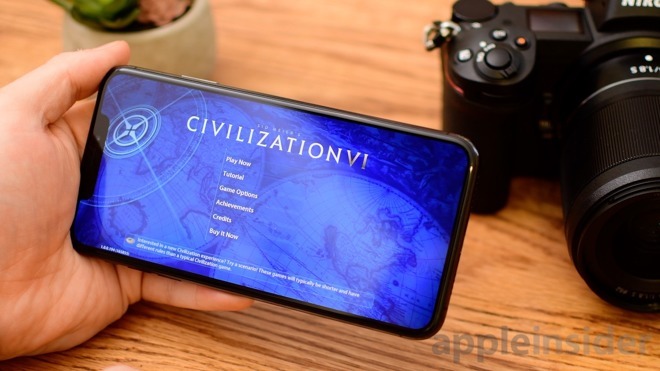 It wasn't long ago we were declaring our love of Civilization VI on iPad, so we were thrilled to see it on the iPhone. This couldn't come at a better time with the recent release of the new iPhone XS Max, the biggest screen ever on an iPhone. 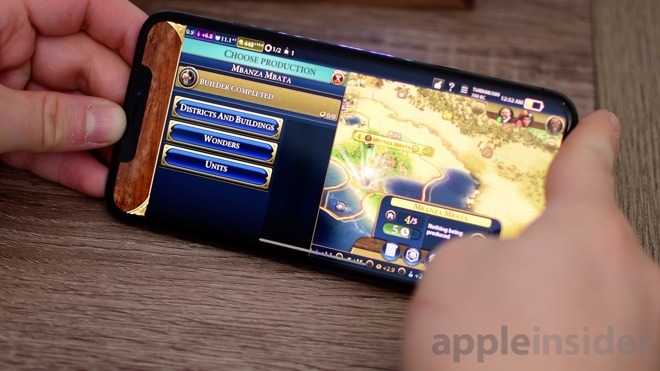 We spent many, many hours toiling away on Civ VI both on the new iPhone XS Max, as well as our smaller-screened iPhone X.
Civ VI does a great job of making use of the display, regardless of which phone you're on. The turn-based menu system is easily navigated and animations feel fluid and natural. There are user interface concessions that still need to be made for the Phone, though. For instance, some of the values on the top of the display are a bit small. On the iPad, it made a bit more sense to exit menus by tapping the screen with three fingers, but that seems slightly out of place on the iPhone. Hands down the best aspect of the game is the fact it is a full-featured port of the title. There aren't any shortcuts or pared-down mechanics to compensate for hardware. When we played the game on our iPad Pro, there were slowdowns late in the game as turns became more complex. The same holds true when playing on the iPhone, though they did seem to take a bit longer to process than the iPad, even on our iPhone XS Max. The A12 Bionic processor is a beast, but — especially with a larger map and many players — wait times can be a bit long by the end of the game. For most, the longest load times will be simply at the start of the game before it begins, where you have to patiently wait a few moments for everything to get going. It still amazes us that the entirety of Civilization VI has made its way not just to iPad, but to the iPhone. There is so much to do with hours of entertainment, without timers, premium currencies, or other nonsense getting in the way. Civilization VI is free to download, and allows you to play the first 60 turns of a game for free. A $60 in-app purchase at full price gives the user the full game, which gives you unlimited turns, custom scenarios, and multiplayer. Since we originally picked up this game a year or so ago, many expansion packs have also landed on iOS, providing additional civilizations, leaders, and maps to take the game even further. Presently, the full game is on sale for $23.99. The other in-app purchases are expansions, and vary from $5 to $8, and are completely optional. Civilization VI requires iOS 11 and an iPhone 7 or 7 Plus, iPhone 8 or 8 Plus, iPhone X, iPhone XS or XS Max, iPad Air 2, iPad 2017, or any iPad Pro. AppleInsider recommends the most powerful hardware you can bring to bear.